Over the course of the last 20 years, vets have reported an increase in malignant lymphoma in cats, already one of the most common forms of the disease, and one which afflicts cats more than any other domestic pet. Feline Lymphoma is a tumour of the lymph nodes, tiny bean-shaped masses of tissue that help to protect against everyday infections by sweeping up and eliminating potentially-harmful bacteria, other disease organisms and foreign proteins from all over the body. They also play a vital role in neutralizing toxins. The lymph nodes also produce lymphocytes, a type of white blood cell which are the body’s natural defenders against infection. These lymphocytes can become defective and start multiplying uncontrollably forcing the nodes to swell under the pressure, producing lumps. If these were to appear in your cat’s throat, for example, they could make it much harder for her to swallow. Because the lymph nodes are interconnected by the lymphatic system, the cancer can spread to other parts of the body and internal organs. Secondary cancers – in the liver, bladder and pancreas – can follow without early diagnosis and effective treatment. In fact, research shows that up to 33% of all cat cancers begin with lymphoma, and 90% of all blood cancers. Lymphoma can form anywhere in her body where lymphocytes are found in great numbers. Currently, the biggest number of lymphomas are seen in the digestive system, but this has not always been so. In the past, many cases stemmed from infection by the Feline Leukaemia and Immunodeficiency viruses, but effective vaccines for FLV and FIV have brought those two diseases under control. Another factor may also be that vets are now much better at spotting Lymphoma in its early stages, meaning that it is perhaps the most stubborn forms of the disease, focussed on the digestive system, which are now being seen. Intestinal Lymphoma is often the result of chronic inflammation of the digestive tract which is also on the rise, and this has been blamed on modern cat diets of dry food and increased levels of contaminants such as iodine. What are the Symptoms of Lymphoma in Cats? Unfortunately, despite the seriousness of the disease if not caught early, Lymphoma can be hard to spot. The change from a healthy Lymph Node to a cancerous one is subtle and gradual, and generally causes your cat little if any pain. Even standard vet’s tests – other than biopsies – may offer no clues either. It also matters where the tumours are growing as to what symptoms you might see. For example, Lymphoma be in the chest can affect breathing while Lymphoma in the brain or spine hits nervous function. If it’s present in your cat’s digestive system, the first signs are usually poor appetite and weight loss, followed by vomiting or diarrhoea. 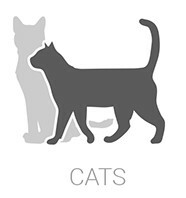 In other cats, the only signs might be a lack of grooming or interaction, or even general lethargy, which as all cat guardians will know can be hard to distinguish from a healthy cat. Sadly, the vagueness of all these signs means sometimes that cats are treated just for the symptoms in the understandable hope that whatever it is will just get better with time. It’s only when treatment proves to no avail that vets begin to look for something more serious, like Lymphoma. In time, you or your vet may detect the swollen lymph nodes as lumps under the skin. As the disease progresses, perhaps to the point of no return, the intestines can thicken and become less flexible, and your cat may become anaemic. Ultimately, only a battery of tests can really provide a proper diagnosis, including a complete physical examination, which may reveal swellings in the gastrointestinal (GI) tract, blood tests and a biochemistry profile to see if organs are infected. Your vet will probably help you to provide a complete medical to rule out other possible – less serious – causes. And there is also the possibility that your vet could perform a fine needle biopsy (or even investigatory surgery) to confirm findings and even begin treatment. The life expectancy of cats with lymphoma varies immensely depending the age of your cat, where the disease is situated and how far advanced it was when first diagnosed. Generally, surgery is not usually enough on its own to halt the spread of lymphoma in cats and without other treatment like chemotherapy, survival time is again only about two months. With aggressive therapy that could be extended by up to two years. Treatment options usually revolve around the goal of improving quality of life for patients for as long as possible. During the convalescent period after treatment, food and water intake should be closely monitored. Following chemo, regular vet’s visits will be necessary for blood tests to monitor progress and keep an eye on any complications, so adjustments can be made as needed. If given, pain relief medication should be used with caution, following all directions carefully, and make sure that all the family knows the dosage schedule. Sadly, a common tragic scenario is accidental overdose of medication by well-meaning owners. Unlike other forms of cancer, Lymphoma in cats rarely leaves its victims in pain. The tumours are themselves very small and unlikely to press on vital organs or nerves and quite often by the time a cat guardian notices the tell tales signs of pain, it’s actually the result of secondary spread or metastasis. Cats are also very good at keeping pain a secret and often give little or no sign that things are getting uncomfortable. But the signs may be there if you look. Has she stopped grooming herself properly? Does she lie in an unusual position? Is she holding herself differently? Has her appetite gone down? Is her breathing too fast? Does she lack her usual energy? Does she purr more? Ironically, cats in pain may actually purr more. Is she more bitey or scratchy, especially if you touch a particular area? It may be a sign she’s hurting. If you have suspicion at all that your cat is in pain call your vet.